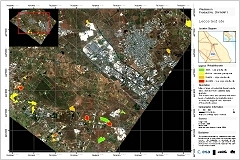 WEOS (Waste Earth Observation Services) project, financed by ESA (European Space Agency), looks at the area of waste management with the aim to extend the uptake of the Earth Observation (EO) based geo-information services already tested and demonstrated in previous projects. The proposed WEOS services will follow a further customisation of the already existing WASTEMON services, using Optical and Radar EO data, in order to respond to the different needs of the European user community involved into law enforcement and intelligence fields of action. Among the International users (i.e. EEA) and stakeholders (i.e. World Bank), the project will see the active involvement of international law enforcement user organization (i.e. INTERPOL). A Consortium led by ERA Maptec involving Planetek HELLAS EPE and GAMMA will tap into a wider market scope with the customization of new services strongly based on: a) algorithms used on other domains (e.g., subsidence, vessel detection, object-oriented classification); b) the capacity to acquire and process satellite data faster in response to users involved with law enforcement. Within this context, the project will spend a strong effort on the legal aspects analysis in order to define the services for their admissibility also for legal purposes and to ensure their trustworthiness in judicial proceedings. A better understanding and dissemination of Earth Observation and its applications by the user and stakeholders. Examples of application of such services are the cases of mapping containers of waste, waste sorting and disposal areas, ship dismantling, environmental impact of illegal waste treatment sites, site extensions and evolution, etc. Providing a monitoring service of sites most likely suitable for illegal disposal of waste will help authorities in countries that receive waste, to cost effectively allocate resources on the ground to clamp down on illegal activities.